When Bruce Lee adapted the Five Angles of Attack from reading about it in a fencing manual, he did not have as complete a vision of all possible aspects of fighting as we do now. With that in mind I think we can expand those angles to include some aspects that are seen in mixed martial arts. 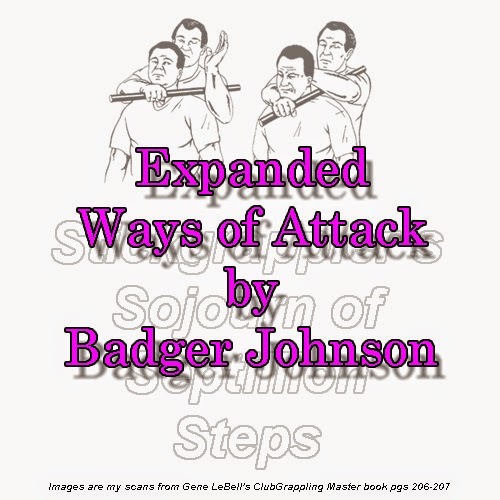 His original notion was a method of grouping attack outside of specific techniques, but those attacks don't cover the grappling ranges very well. It would be not be as descriptive or useful to explain a throw, a takedown, or a submission in terms like SAA, since it's not a single motion. RANGES - A better method of analysis is achieved by grouping attack methods by range. · Single Attack (SAA) - a single, simple attack. · Attack by combination (ABC) - using a planned flurry of blows to open lines. · Indirect attack (PIA) – attack with faking, feinting. · Hand/Arm/Leg/Body immobilization attack (IA) - any attack, including grabs, parries, blocks or traps, which opens a line. · Attack by Drawing (ABD) - opening a line to draw an attack, which bring the opponent into range or creates vulnerability. · Attack by Sacrifice (ABS) - taking a hit to open a line. In chess giving up a piece to open a line, gain territory or advantage. · Attack by Leverage (ABLE) – attack by various whizzers, trips, sweeps. · Attack by Penetration (ABP) (takedown, tackle). In wrestling, you lower the level and then acquire the hold via the penetration step. · Attack by Unbalancing (ABU) – attack by removing the center of gravity beyond the base of support. · Attack by Lifting (ABLI) – attack by suplex, body lock twisting lifts, spiking and spearing. · ABD - same as above but with specific elements, including sprawling. · Attack by Sacrifice (ABS) - Sacrifice throws, giving an advantage to get leverage, pulling guard. · Attack by top control or position - (ABTC) In ground grappling, top control serves as an attack by positional dominance. · Unskilled opponents can tap to being under top control in a panic. · Attack by Submission (ABSub) - a type of positional dominance attack, but with ability to end the fight immediately. · ABD - An ABD but with specific grappling elements. · Attack by Sacrifice (ABS) – attack by giving up a limb to get a sweep. NOTE: My sincerest gratitude to Badger Johnson for his kind permission in posting his essay here. Please leave a Comment/Feedback for Badger below.